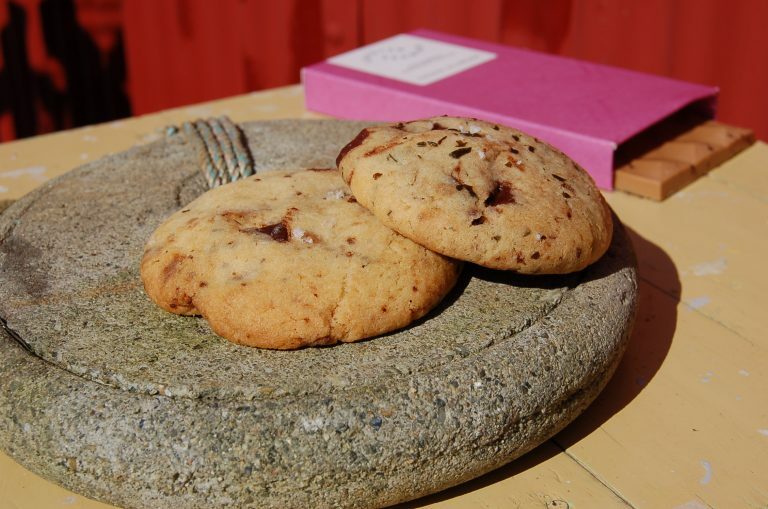 Sugar Kelp Chocolate Chip Cookies - Lofoten Seaweed | From Lofoten, Weed Love. 1. Preheat the oven to 180ºC/160 ºC fan. Line two baking sheets with baking paper. 2. Beat the butter and sugar in a large bowl until pale and creamy. Crack in the egg and mix well. 3. Sift in and fold through the flour, baking powder, bicarbonate of soda and salt. Roughly chop and stir in the chocolate and the seaweed if using plain chocolate. 4. Roll tablespoons of the dough into balls and place onto the lined trays, leaving space between them to grow. Flatten the balls slightly with your fingers sprinkle with sukkertare salt, then place in the hot oven for 12-14 minutes, or until lightly golden. Leave to cool completely.